Today’s all memories. Dad passed away more than decade ago early in the morning while I was still asleep a few miles away at the Anchor Motel at Scarborough beach. The night before, at his home in Coventry, I sat beside him and we watched a great ball game on tv–the Red Sox trounced the Baltimore Orioles. At that point, he had been in hospice care for only a day. He told me the doctors said there was nothing they could do for him and sent him home. “I want to die in my own bed,” he said. I forget who called me, but I drove back to the house in time to be with his body for a little while as Dad lay there under the covers, and we waited for Ianotti’s Funeral Home to come over. Two fellows drove up in a station wagon with a gurney and a canvas stretcher rolled up like a small flag pole. Odd details. A gray day, slate sky, raining softly. Trying to keep the raindrops off dad’s face as they carried him outside. The back of the wagon had some flowers and bulbs and garden tools, as if they might bury him deep in a garden somewhere nearby. My sister delivered a bowl of new baseballs and magic markers to dad’s wake. Family and friends wrote personal notes to Dad on the baseballs so when the day of the funeral came all these baseballs rolled around in the bottom of dad’s casket, a light blue casket with embossed seagulls all around. The most special baseball, with a note from his grandson Derrick, was placed under dad’s hands. As our family greeted those who came to pay their last respects, we heard stories of 1957, the year Dad coached the Coventry High School baseball team to a Division Championship. We heard how they loved Ted Williams Baseball Camp when dad was coaching there, and how he and Ted Williams were friends. We heard how, along with our mother, he taught so many local children to swim at Lake Tiogue. Next door to dad’s wake that evening, a solemn service with a full honor guard was under way for the first young woman from Rhode Island to die in Iraq. Like dad, she too would be buried at the Veteran’s Cemetery in Exeter within the week. Some of his friends called my Dad “Teddy Mac.” In the photo above, he’s on the ballfield after practice near our house. 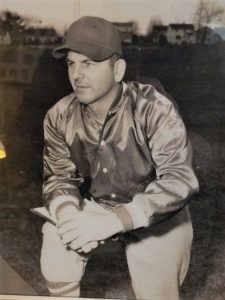 He coached the Coventry High School baseball team to a Division championship in 1957. Very big deal back then. I think there was a parade for the team! More importantly, Ted Ciesla coached the team fairly, he made sure to give kids a chance to play. No matter their skills at the plate or in the field, if kids showed up after school to practice, then later on they donned their CHS red and white uniforms for real games. They rode the bus to away games as far away as Westerly. I got to be the bat girl for the team’s home games. A third grader, I sat with the team on the long bench behind first base. Every time a player up to bat made a hit, I ran for the dropped bat and returned it to its place. Recently, I heard from my sister that there’s something in the works to honor Dad in the local Hall of Fame. He deserves the recognition because first and foremost he gave kids a chance to play ball even if their skills were not that great. With my Dad as team coach, every kid had a chance . . .
On the ferry to Block Island in 2008, I asked a young man to take my photo. A sunny day. And of course a bit of wind as the “ship” chugged along passing the North Light, then the rocky beach near Old Harbor. I was on my way to a weekend of poetry, readings, and other excitements at Lisa Starr’s “Block Island Poetry Project”, based at Hygeia House over on the west(ish) side of the little island near Smuggler’s Cove. 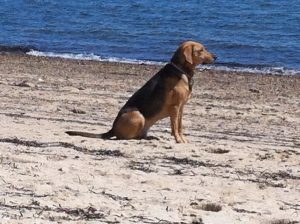 Here’s Betsy, Percy’s friend on the beach at Provincetown Harbor. Of course she did. Back then she walked the beach every morning with her dog. I think it was Percy then, but I’d have to check with my friend, Cynthia, because I was in Provincetown for only a week, getting up early for poetry workshops every day at the Fine Arts Work Center, I was not at the beach that early, nor did I want to disturb Mary on her walk. Anyway, here’s a photo of darling Betsy! The next afternoon, Mary gave a reading “in town” at St. Matthew’s church. Lisa Starr introduced Mary to the “congregation” of poetry lovers and poets, including Coleman Barks, Valzhyna Mort, Richard Tillinghast, and others. Mary made sure before she began that Lisa’s blond lab, Brother, was allowed in for the event. I wish I had thought to bring my dog Scoutie, but honestly the idea never occurred to me. Poetry weekend 400 miles from home? Bring my dog? Duh. Our last day there, soon after breakfast, Mary offered to sign books. Red Bird, her newest book that year, was available and I was there in time for her to sign a copy for me. More than any other photo, this one is now closest to my heart. In a heart place like Block Island, you can have a special moment with a writer. You can lean in, listen to what she is saying to you, and feel grateful to be there with your hand on the back of her chair. As I watched her pen move across the page of my book, I had no idea how much this moment would mean to me some day. I’m amazed it’s only eleven years ago. Mary Oliver (seated) is signing her book, Red Bird, for me (left) one morning in 2008 at the Block Island Poetry Project, hosted by poet Lisa Starr. Before it starts raining, I’m heading over to the Civic Center Building in Silver Spring to cast my vote in this mid-term election. Early voting is underway at 11 sites around Montgomery County from 10 am to 8 pm every day until November 1, All Souls Day! Okay, if you think about it, voting is a purely human endeavor. We are the only species that takes it upon ourselves to change our governing bodies on a regular basis, right? In the animal kindom (we stopped saying “kingdom” a while ago), there’s a built-in hierarchy based on age and/or ability and whether you are born into a matriarchy or a patriarchy. In other words, for example, pandas can only “vote” for pandas. I’m happy about being human and going to the polls. Does it matter who we vote for? Well, in a democracy, we are left to our own ideas about who will serve our Nation best. We all have a different set of criteria to decide what “best” means. Because I grew up in New England, I’m an old-fashioned kind of voter, a patriot I guess I’d call myself if you asked me. Most important to me is a good education for every child in America. And of course a high functioning agricultural system delivering wholesome food to every town in the country. But what about housing? People need affordable housing too, right? And which of our local candidates knows the best way to offer a solid roof, strong door, and a few windows to every family around here? Hmmm. now things are getting a little emotional and complicated. Simplicity is the key. Maybe. Is living in the woods every night considered freedom? Long story short, I need to talk to a few of our local candidates a little more. I’m sure they have some ideas. 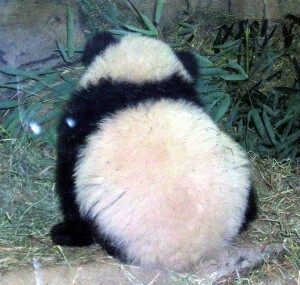 The one thing I do know for sure is this: I wouldn’t do very well in a mountain terrain looking for bamboo for breakfast, lunch, and dinner. Wish me luck at the polls!!! The great poet Wislawa Szymborska is my great hero . . .
April is Poetry Month. Some of us walk around reciting our favorite poems out loud, sign up for an open mic, or (drumroll please) apply pen to paper and write an original poem or two to celebrate the moment we are standing in. There’s a lot in a moment: a breath, a tummy growling, a smile from someone at the bus stop, remembering it’s trash day . . . The last time I had a session with the beautiful spirit of Dr. James Martin Peebles through the channel, Summer Bacon (her website is summerbacon.com), I felt sad. But Dr. Peebles is the best reminder that “you life is what you make of it.” In other words, what’s to be sad about? What I felt sad about was that I had drifted away from my poetry writing . . . for 2 years now, I’ve been thinking about poetry, helping with the Third Thursday Poetry Series, and listening to poets read or recite their poems . . . but where were mine? In big stack above my desk, that’s where! So now I’m making a promise to myself to write a line, or a stanza, or a whole poem, every day. Actually, when I sat down to write this blog, I had no idea this would be the topic! Poetry gives me a chance to feel grateful for this life, to feel the spirit rise within like the tiny wild violets popping up in the yard full of the desire to be in the world, being a part of everything — the dog steps on their petals, the wind ruffles their delicate leaves, the rain brings sweet water to their roots. Anyway, every moment is perfect in its pulsing center. Fearless, the seconds tick by. Life is short. Everybody knows that in theory. But it’s true. We are here for a basket of moments, akin to flower petals and moonlight . . . How many sunrises left? Enough and all we need until another National Poetry Month comes around and we have our own book of poems to share with the folks who love us and cherish our time together. See you at the Third Thursday Poetry nite at the Takoma Park Community Center! And bring a poem to share at the reception! On March 5, 1928, my Grandmere gave birth to her first child. She named her Janice Helene. As the story goes, my Grandmere’s favorite novel at the time, Janice Meredith, inspired the baby’s name. To continue the literary inspiration into the next generation, my mother named me Meredith. I have a sneaking suspicion that my mother never read Janice Meredith. It’s a novel about the Revolutionary War, George Washington (we lived on Washington Street), and lots of shooting back and forth between us and the Red Coats. Rockets red glare, snowy battlefields, and bloody uniforms. Not really my mother’s reading interests. My mother loved sunbathing and icy Lime Rickeys on our chaise lounge as she read her Book-of-the-Month Club selections, novels by Graham Greene, Katherine Anne Porter, or Mary Renault. She loved to play “Don’t Mess with Bill” and “Finlandia” on her granny Nellie’s piano, a 1905 Steinway, set in the northwest corner of our music room. As a child, my mother had a big collection of porcelain-faced dolls. I have a picture of her when she was about six or seven with her dolls all around her. So Happy Birthday, mom. My daughter reminds me you would not have enjoyed turning 90; you left this planet for the heavenly realms shortly after your 70th birthday. I guess I’m glad the novel’s title was only two words long; otherwise, my own children’s names may have been characters in the novel too. Or I might have stayed with the literary theme and named my son Huck Finn. My daughter? Well, that’s a mystery. Weather.com is reporting a hurricane heading towards Cabo San Lucas today. The edge of the storm may reach San Ignacio Lagoon by early next week. Keep La Laguna in your hearts and hope the storm passes! Visit Weather.com for updates! And on the East Coast of the United States, Hurricane Jose may reach as far as Cape Cod with its 80 mph winds, as early as next week. 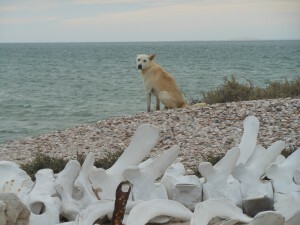 One of the beloved dogs at Antonio’s Whale Camp in San Ignacio Lagoon, Baja California Sur. Retirement is an open field where you wander around, maybe followed by a few cows wearing (of course) cowbells and mooing now and then so you know they are still behind you, or you might prefer goats who love to eat poison ivy and would eat your jacket buttons if you let them. In other words, until you can find a way to focus on what day it is, you’ll call every day Friday, a Robinson Crusoe choice. The six other choices don’t really stick with you, floating off on a wisp of a breeze, never to be thought of again. So what day is it?? That’s right! Friday! Unless your phone calendar convinces you it’s Monday and you believe everything it tells you! 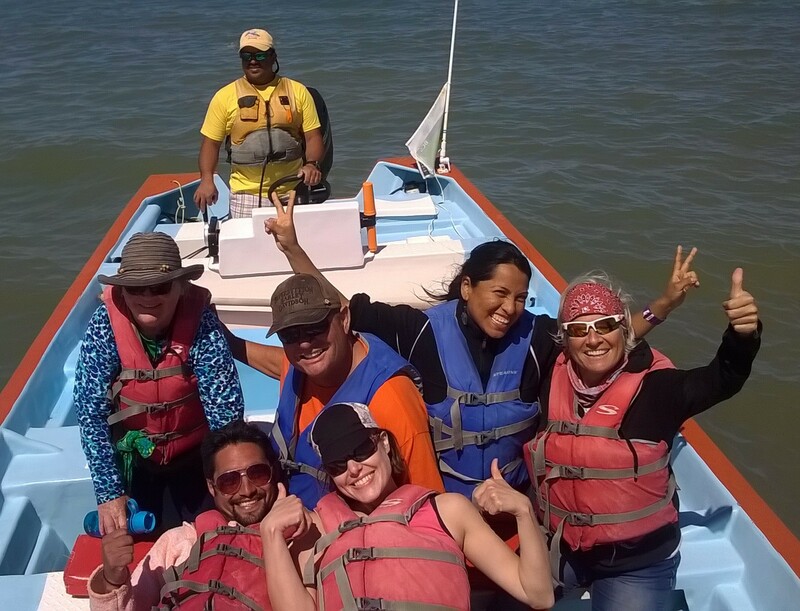 For 2017, the month of March found us at Antonio’s Whale Camp for the Vernal Equinox with some stellar company and a bit of a wind and waves churning up La Laguna for our panga rides out to the observation area where only 17 pangas from each of the 6 whale camps are allowed in at any one time. 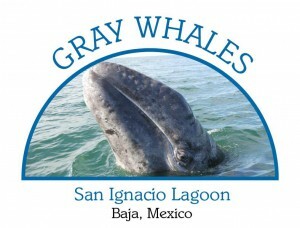 So far in all the years visiting the gray whales and their babies, I remember only one time when we had to wait for the okay to enter the area. Maybe twice. 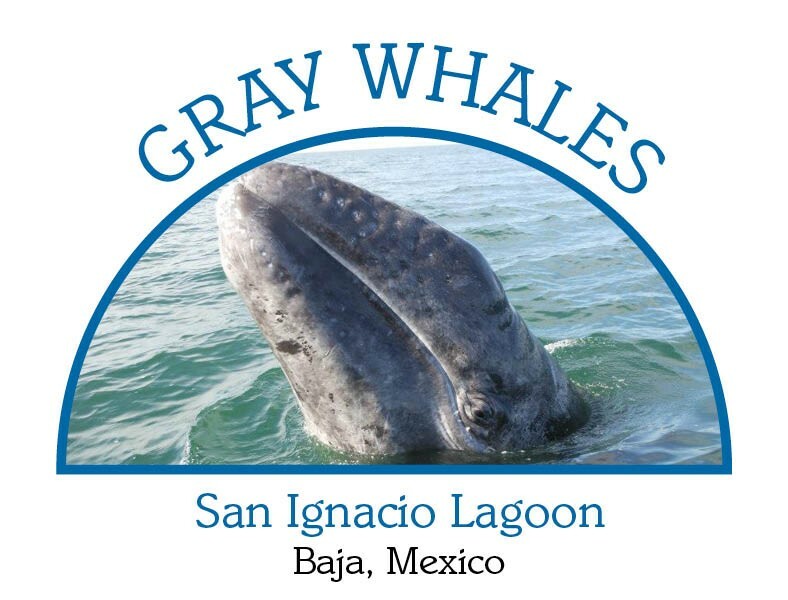 My daughter, Erin, joined in the celebration along with a car load of friends from 4 years ago driving down from Baja North to revisit the whales. 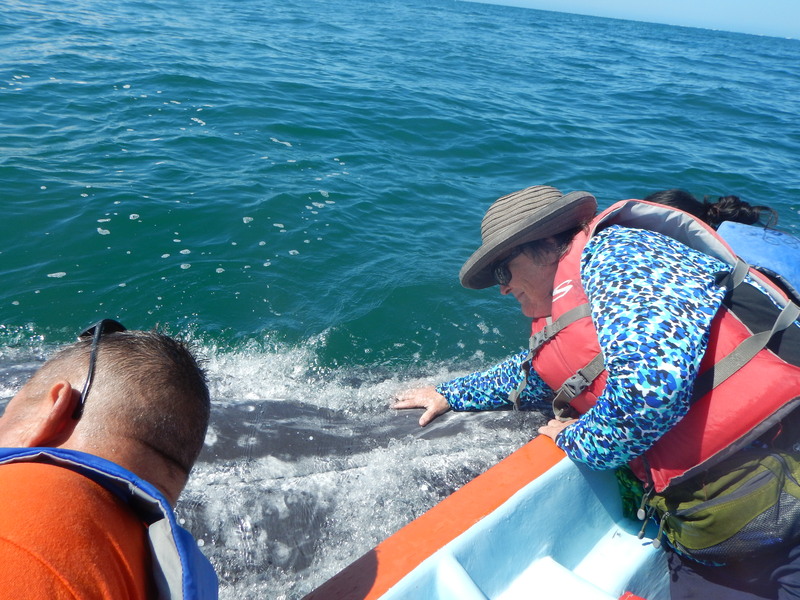 Because of the wind, the whale mothers helped their babies stay up above the waves and held them near to be petted. 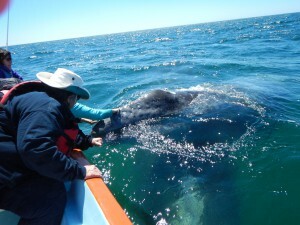 Then both mother and baby would swim under the panga and give us a bounce for fun. As the babies swam around us, the mothers kept a watchful eye, and sometimes took time to stretch out so we could see the size of their awesome bodies. Because this was Erin’s first trip to San Ignacio, I thought it would take her a while to get used to moving from one side to the other in the small space available between the seats . . . but she balanced her camera and made her way around every vantage point to get a chance to pet a baby whale. Meanwhile, I did manage not to fall overboard at any point in our laguna rodeo ride — pretty rough out there!!! Welcome to a bright cool lovely fall day here in Takoma Park! And yes things are happening . . . Takoma Park’s annual street festival happened on Sunday, October 2, and a big thank you to the rain clouds for rolling back the deluge for a couple of days so that our folks could enjoy the local arts and crafts, and some cool temperatures to enjoy the day. Roscoe the mascot for the town of Takoma Park is now featured on the town logo! We might wish for a little more detail and a little more color, but this is a start!! 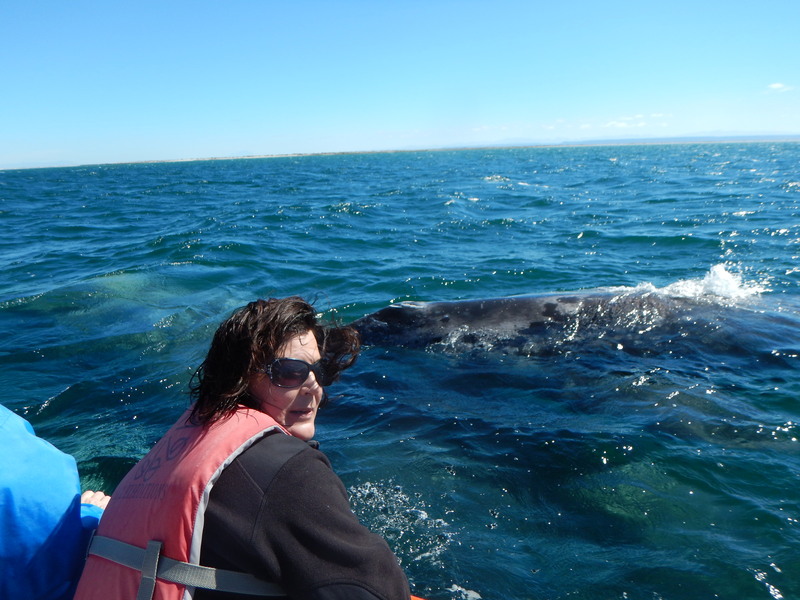 The trip to Antonio’s Whale Camp in mid March 2016: In a word, amazing!! Enjoy the photos! Front left is Moises. He took the photo of me petting the mama whale. Daniel is our guide and panga driver. I’m on the left behind Moises in the brown hat!! whale watchers take a moment for a photo. 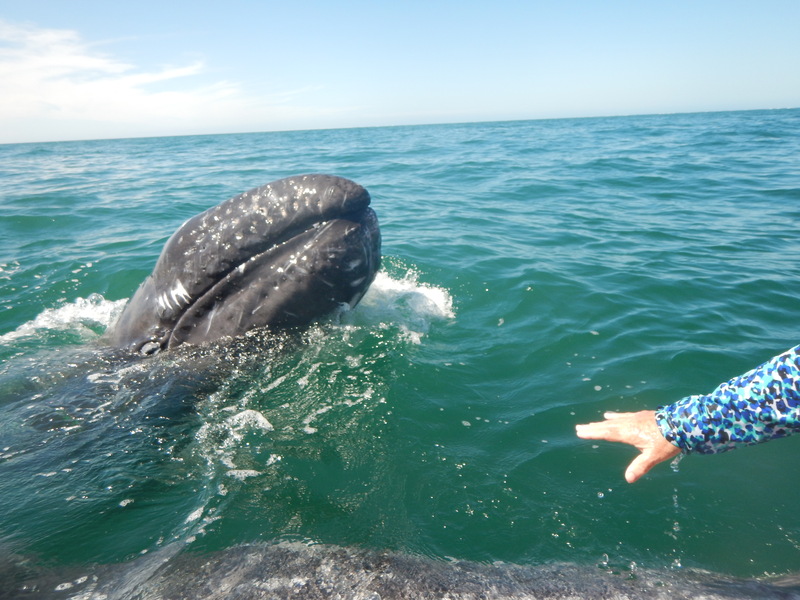 Here’s me reaching out to the baby gray whale, hoping she will swim over to greet me. The big mama whale rolls over on her side so I can touch her. 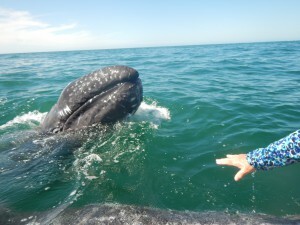 Gray whales like having their gums rubbed! But they have to open their mouths for a human to do that!